You don’t have to be a social media ninja to be a successful blogger. (Click to Tweet that!) In fact, your blog posts can go viral without you ever having to share them on Facebook or Twitter. All you have to do is make your posts shareable. 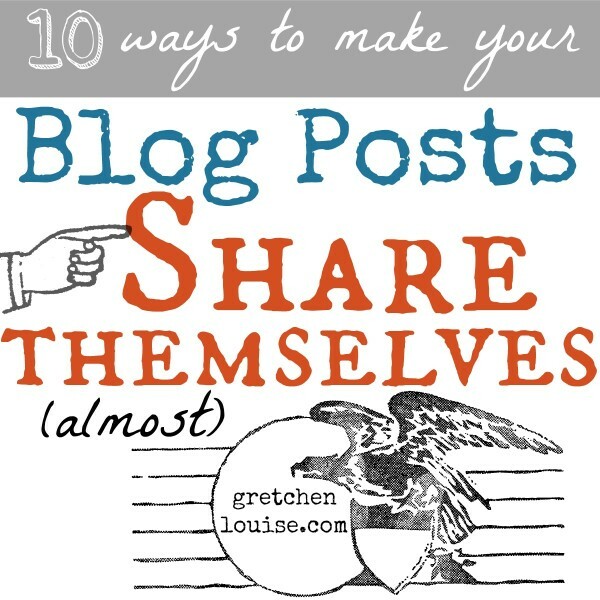 Here are ten ways to make your blog posts so easy to share that they almost share themselves. If I want to like your post, I want to like your post. I don’t want to have to open a new window, compose something witty, and press Share. I just want to click Like. Give your readers the generic Facebook “Like” button. Keep your share buttons front and center no matter where your readers are on your post. Use a plugin like Floating Social Bar or Digg Digg to “float” your share buttons above or beside your post. Just be sure to test it on a variety of browser and device sizes–you don’t want your share buttons to be completely missing on small screens. Don’t give your readers too many sharing options to choose from. If you use LinkedIn, give them the LinkedIn share button. But if your blog doesn’t have a thing to do with business, there’s no need to offer a LinkedIn share button. Pick the social media networks that you want your blog to be shared on and display those share buttons only. If someone uses a random, obscure social media network, they’ll probably have the bookmarklet or app for it–you don’t have to offer every option on the web in your share buttons. Avid pinners will pin your posts out of habit, but the average user needs to be reminded to pin posts. Make a Pin It button pop up whenever they move their mouse over one of your images, or custom code a Pin It button below your image. Pinterest’s widget builder has code that makes it super easy to add an on hover Pin It button to all your site’s images with just one line of code. You can also fill out the URL, image, and description and then copy and paste the code to put a Pin It button right below your image (and show the pin count, too). Your post may be filled with pithy quotes, but if you make your one-liners easy to click and share, you are more likely to be quoted. Twitter’s button page also allows you to compose your own Tweet with a link to share and insert the official Tweet button in your own post. Thanks for your post! I didn’t know about the ‘click to tweet’ option… that is very interesting and something that I will definitely consider in future posts! These are great especially the tweet it one liners! Thanks! Awesome tips! Thank you so much, I’m just learning to blog and these are the kinds of tips I really need. These are some great tips. Running over them one more time to see if there’s anything I need to adjust for my blog. I’ve been wondering how to do the Pinterest widget… Thank you! Is RealTidbits what you use on Kindred Grace?